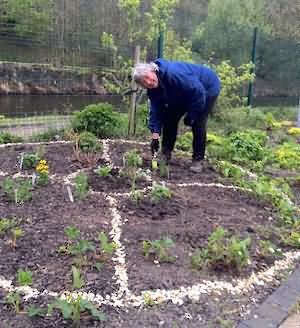 Tucked away at the side of Todmorden Health Centre lies a little piece of herbal heaven. 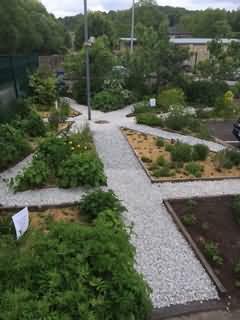 Volunteers have been busy transforming the Incredible Edible Apothecary Garden. They’ve restored the themed beds, created new collections, laid new gravel paths and are now making it easier to see what’s what with new labels and an interpretation board. 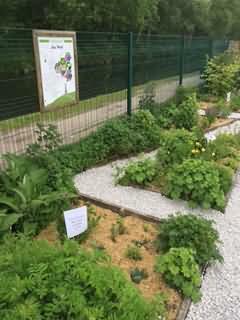 The garden, hidden between the staff car park and the canal but open to the public, is a place for growing all sorts of herbs with historical or modern uses, from treating coughs to making stews taste delicious. One of the newest sections is a first aid bed, with plants such as comfrey, Good King Henry, heartsease violet and musk mallow. Another is the witches’ healing, ritual and spells section, filled with plants linked to air, fire, water and spirit. There’s everything from honesty to clover and wild carrot to valerian. One bed remains the ‘What is a weed?’ collection – a slightly scruffy, but useful collection of plants we usually think of as baddies, including dandelion, nettle and dock. Even these humble plants have their uses, though, so ‘what is a weed?’ is an interesting question. Two beds are allocated to Elizabethan strewing herbs. These herbs were put on top of rushes in Elizabethan homes to mask unpleasant smells and to deter pests such as fleas. The many gaps in the smaller bed have been filled with daises, cowslips and violets and are looking very colourful. The larger bed has a new rosemary bush, sage and meadowsweet and overgrown mint has been removed. The women’s health bed has been weeded and new plants introduced, including hawthorn, raspberry canes, milk thistle and nettle. 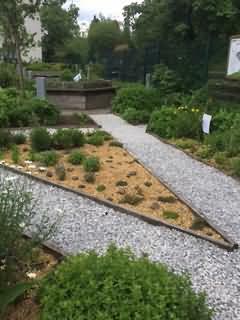 The raised circular aromatic bed has been partly planted out with chives, lavender and thyme. Self sown camomile and calendula marigolds are also germinating and some as yet unidentified maroon coloured seedlings! The Mediterranean herb section is now filled with oregano, thyme, sage and even a new basil designed to cope with a British ‘summer’. The dyes section has been planted with woad, dyers’ chamomile, madder and cornflower.